SUPERCART® - PIONEERS IN THE WORLD OF TROLLEY DESIGN & MANUFACTURE. The trend towards quick and convenient shopping has created the need for the Mini Hybrid shopping trolley, which is custom-designed for navigating shops the convenient way. The Mid-Size Hybrid shopping trolley offers the best of both plastic and steel and boasts premium quality finishes. With beautiful styling, robust engineering & low maintenance, the Mid-Size Hybrid shopping trolley will be a great investment for your business. The Superbasket’s longitudinal handle makes shopping more comfortable. It is compatible with most existing basket trolleys, as well as with all competitor basket stands. Our trolleys and handbaskets are on the cutting edge of innovation and we are proud to introduce a dynamic new range of locally manufactured, hybrid trolleys, boasting polymer baskets and metal chassis. Every retailer needs a trolley manufacturer that understands the needs of their customers. Supercart combines 30 years of insights into consumers’ needs with a passion for innovation, respect for the environment and a desire to drive your business forward. 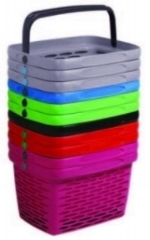 Supercart is a dynamic, innovative company focused on the design, development, marketing and sales of a wide array of shopping trolleys and hand baskets. Supercart’s range of hybrid trolleys are stylish, tough and durable. They are available in a variety of colours in order for them to enhance any branding strategy. For over 30 years, we’ve been “pushing” the boundaries of trolley design. It all started in 1986, when we imported a five-wheeled trolley from Canada to South Africa. Since then, the wheels have turned and we now manufacture our own trolleys in South Africa, Australia and export them to India, Malaysia and around the world.